The European Patent Office (EPO), the Japan Patent Office (JPO), the Korean Intellectual Property Office (KIPO), the State Intellectual Property Office of the People's Republic of China (SIPO) and the United States Patent and Trademark Office (USPTO), referred to as the IP5 Offices, announced on 24 September 2013 their intention to launch a comprehensive Patent Prosecution Highway pilot programme. 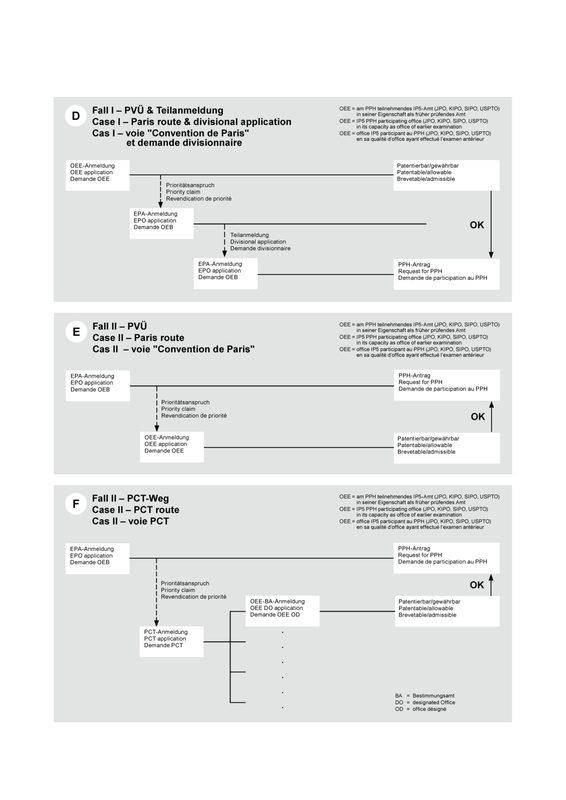 The Patent Prosecution Highway leverages fast-track patent examination procedures already available at the offices to allow applicants to obtain corresponding patents faster and more efficiently. It also permits each office to exploit the work previously done by the other office. The present notice replaces those published in the OJ EPO 2012, 60 f., 75 f. and 89 f.
Where the EPO work product contains one or more claims that are determined to be patentable/allowable, the applicant may request participation in the PPH pilot programme at one of the IP5 partner offices, i.e. JPO, KIPO, SIPO and the USPTO. The procedures and requirements for filing a request with these offices are available from their respective websites. while the Office of Later Examination (OLE) refers to the office before which participation in the PPH pilot programme is being requested, i.e. the EPO. The IP5 PPH pilot programme will commence on 6 January 2014, for a period of three years ending on 5 January 2017. The requirements laid forth below will apply to PPH requests filed with the EPO on or after 6 January 2014. The EPO will evaluate the results of the pilot programme to determine whether and how the programme should be fully implemented after the trial period. The trial period may be extended if necessary to adequately assess the feasibility of the IP5 PPH programme. The EPO may also terminate the IP5 PPH pilot programme early if the volume of participation exceeds a manageable level, or for any other reason. Notice will be published if the IP5 PPH pilot programme is terminated before 5 January 2017. (1) The EP application for which participation in the PPH pilot programme is requested must have the same earliest date with the corresponding application, whether this be the priority or filing date of a corresponding national application filed with another IP5 office (see Annex 1) or a corresponding PCT application for which one of the IP5 offices has been ISA and/or IPEA[ 1 ] (see Annex 2). (2) The corresponding application(s) has/have at least one claim indicated by one of the IP5 offices in its capacity as a national or regional Office, ISA and/or IPEA to be patentable/allowable. [ 2 ], [ 3 ] The claim(s) determined as novel, inventive and industrially applicable by the ISA and/or IPEA has/have the meaning of patentable/allowable for the purposes of this notice. 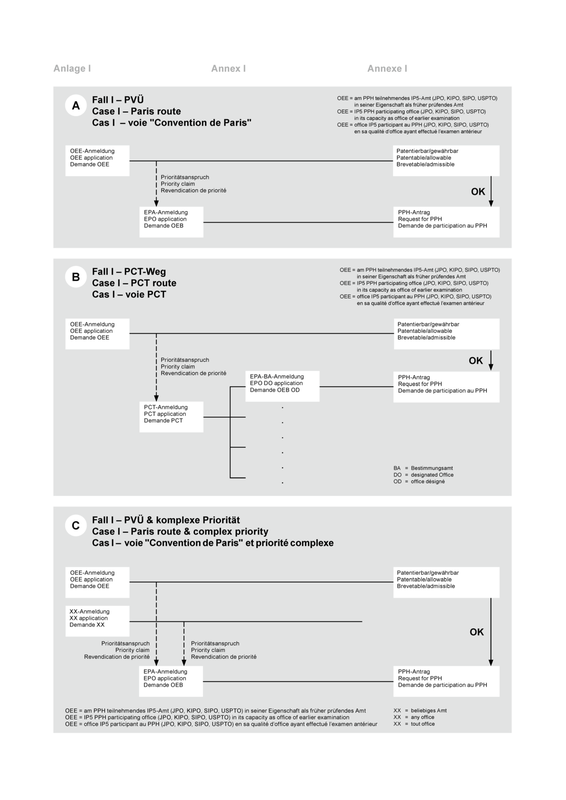 (3) submit a copy of either all the office actions for the OEE corresponding application(s) containing the patentable/allowable claims that are the basis for the PPH request, where applicable, and a translation thereof in one of the EPO official languages, or the latest work product in the international phase of a PCT application, the WO-ISA or, where a demand under PCT Chapter II has been filed, the WO-IPEA or the IPER, where applicable, and a translation thereof in one of the EPO official languages. When the requirements set forth above are met, the request for participation in the PPH pilot programme will be granted and the EP application will be processed in an accelerated manner. In those instances where the request for participation in the PPH pilot programme does not meet all the requirements set forth above, the applicant will be notified and the defects in the request will be identified. The applicant will be given one opportunity to correct formal deficiencies identified in the request. If the request is not corrected, the application will be taken out of the PPH pilot programme and the applicant will be notified. (b) are available via the resprective Dossier Access System (DAS) [ 5 ] or Patentscope, the applicant does not need to submit a copy thereof, but has to provide a list of the documents to be retrieved. Machine translations will be admissible for the documents identified in points (3) and (4). 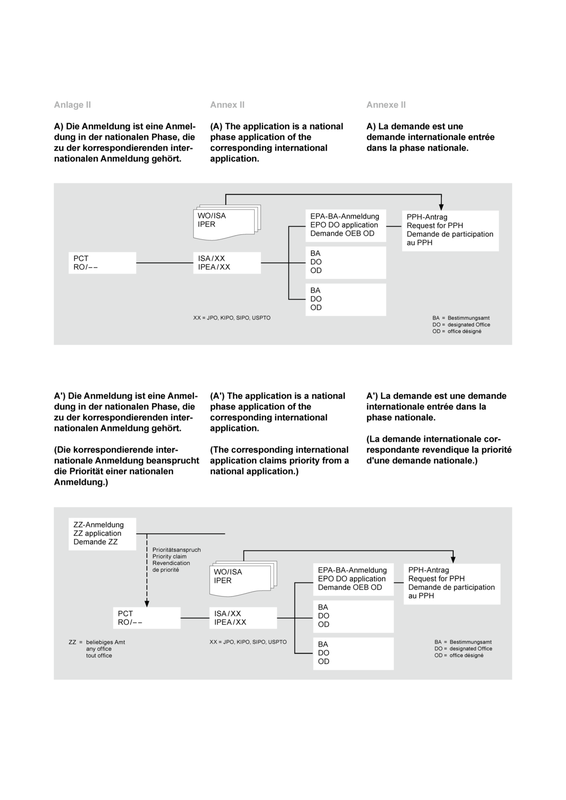 The EPO will request applicants to submit a translation of the documents identified in points (3) and (4) above, if DAS does not provide a machine translation. The EPO can request applicants to submit an accurate translation, if the machine translation is insufficient. If the OEE application(s) is (are) unpublished, the applicant must submit the documents identified in points (3) and (4) above upon filing the PPH request. Once the request for participation in the PPH pilot programme has been granted, the EP application will be processed in an accelerated manner. The conditions applicable to the PACE programme[ 6 ] shall apply by analogy to the prosecution of EP applications processed under the IP5 PPH pilot programme. [ 1 ] Either the JPO, KIPO, SIPO or the USPTO has been ISA and/or IPEA. Applications for which the EPO was ISA and/or IPEA are not eligible for processing via the PPH before the EPO as DO/EO. The EPO understanding of the PPH is that an application is processed in an accelerated manner on the basis of a patentability assessment made by another office. 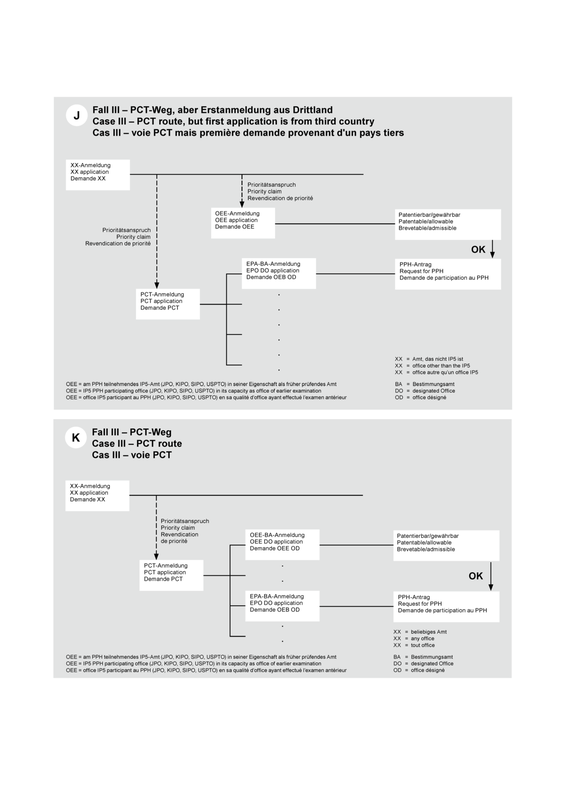 Where the EPO has been ISA and/or IPEA, the PCT WO/ISA or IPER have effectively the same status as a first communication in substantive examination before the EPO as DO/EO. Thus, in this case there is no work product that can be considered as work done by "another" office. This case can, however, fall under the regular programme for accelerated processing of European patent applications ("PACE") which the applicant can request. At present for invention concerning Claim _, no reason for refusal is found." [ 4 ] In cases where the OEE action does not explicitly identify claims that are patentable/allowable, the applicant must also submit an explanation which individual claims are patentable/allowable and how these claims are delimited over the cited prior art. [ 6 ] Notice from the EPO dated 4 May 2010 concerning the programme for the accelerated prosecution of European patent applications – "PACE", OJ EPO 2010, 352.